Monday is the 5th anniversary of the first Tweet, sent by @jack, founder of the 140-character communication service. It’s also World Poetry Day, a coincidence that did not go unnoticed by the New York Times this weekend (read, if the Old Gray Lady‘s new paywall hasn’t gone up, the story here. Twitter has been a great outlet for poets almost since the beginning. As the Times points out, the constraints of the service are perfect for haiku or a loose approximation of the form. The poet and editor @poeticmindset even has a poetry challenge called the #haikuthrowdown. Here is a list of some of the poets on Twitter, compiled by Collin Kelly, and a Twitter list of poets, presses, libraries, and poetry lovers that I curate. Some of us sprinkle poetry into our every day Twitterstream, whether linking to poems we love, poems we’re reading, or poems we are working on. The journal 32 Poems hosts a #poetparty on Sunday evenings at 9PM ET, which brings together poets from around the world. I was an early adopter of Twitter, thanks to Fred Wilson, who got me hooked several years ago, and have often shared poetry or poetic observations among my regular tweets @greenskeptic. I love baking bread and pizza. I make my own dough and everything is done by hand — from the starter to the kneading and shaping. Back in the late 1980s, I contemplated going to apprentice with the famous French boulanger, Lionel Poilâne. I still fantasize about opening a bakery/pizzeria. 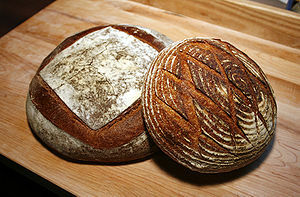 My good friend Mark Herrera, who lives in San Francisco, also loves to bake bread. We often swapped recipes and shared stories of our bread baking. Once he shared with me a starter that had been in his family for years. after a long hike on a summer’s day. the acrid odor filling the cabin of the plane. She says that not to let her test it is tantamount to lack of love. He gives in, just to see her face grow sanguine and lustful. then, nervous over numerology, he baked a fourteenth. with a distinguishing mark using the blade of a sharp knife. In the bread bowl, he mixes flour, water, salt. folding and pulling, lets it come into fullness. so finely crusted, so evenly textured, so giving of itself. In the spring of 1997, I was living in Anchorage, Alaska, and was invited by the University of Alaska Anchorage to put together a program for their annual Writing Rendezvous conference. I thought about the fact that I was in Alaska and we were coming to the close of a century and that poetry seemed to be at a crossroads. And then I thought about John Haines. Any panel on poetry in Alaska must feature John Haines, I thought. Haines was a kind of unofficial permanent poet laureate of Alaska. Since moving there to homestead in 1947, Haines had crafted and composed poetry of great solitude and sincerity out of his Alaska experience. Haines was pleased to join the panel, although he said something about being too old to be of interest to the audience. Then I told him the panel would be rounded out by a young spoken word poet and an Alaska Native woman poet. He got a spark and became more interested in the prospect. I don’t remember much about the panel — and I confess I don’t have my notes at hand. It was called “Poetry at the Edge of the Millennium” or somesuch. I do remember the panelists were engaged with each other and engaging to the audience. And I recall that Haines stirred up a bit of controversy on the panel talking about spoken word versus conventionally printed poetry. That was pretty typical for the poet. So when I heard that John Haines died last night in Fairbanks at the age of 86, I thought about his poetry. And there he crafted poems out of a spiritual wilderness where his solitary imagination confronted existence without the comforting illusions of society (to paraphrase poet Dana Gioia).